At Travelbag, we've been arranging fantastic holiday destinations throughout the world for over 30 years. Thanks to our range of holiday options in Vietnam, combined with our travel experts' knowledge of the very best hotels, excursions and flights, we can create your perfect Vietnam holiday. Today’s Vietnam is a country of fantastic influences. Developing at a phenomenal rate, it is a wonderland of ancient heritage visible through imperial tombs, ancient palaces and beautiful places of worship. Tempered with that is the technological advancement of the cities, the Grand Old Lady of the Orient, and the cities that flash past at a hundred miles an hour. 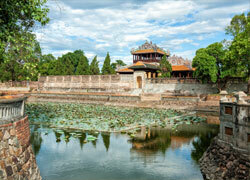 Vietnam has been charming travellers since reopening its doors in the early nineties. Visitors will discover a dynamic country with a subtle blend of ancient values and a modern nod to the future. Vietnam is also home to one of the most fantastic cuisines in the world, with spicy dishes that have a delicate French twist. Set against a stunning backdrop of lush green valleys, miles of golden sand beaches and swaying palm trees, Vietnam is a country famous for its natural beauty. From the majestic mountains of Cao Bang to the somewhat unearthly waters of Mekong Delta, a beautiful stretch of watery rice fields and tiny villages, Vietnam is a country like no other. Its people are tough, very friendly and love a party or two. The Vietnam nightlife truly has a reputation which precedes it; taken with a dose of humour, it’s a fantastic, fabulous blur of cabarets, theatre, dancers, bands and live venue entertainment. Vietnam is an eclectic mix of diverse cultures, religions and beliefs that transcends into instantly recognisable architecture, from the tiny leaning shanties of downtown Vietnam, to the imperial majestic peaks of the temples. With a fantastic blend of French, Indian, Chinese and Malaysian influences, nowhere else on earth do these dramatically different cultures blend together so perfectly. To the north, the ancient Chinese influence is much more prevalent with imperial gabled architecture, ancient Buddhist temples and spicy, rich noodle cuisine. To the south, Indonesian influence is apparent through the Cham temples and sweet, spicy food. The remnants of French occupation are felt everywhere; from beautiful landscaped gardens to the colonial style three storey buildings. Old throwbacks of the American war are still felt strongly too, particularly in the cities where old remnants of battle can still be seen amongst the gabled buildings and French corner cafes. If you fancy getting stuck into the pace of Vietnam city life, a trek around the colonial style cafés and tea parlours is a fantastic way to meet the locals. Check out the myriad markets and street stalls selling everything from watches to local handmade crafts and clothing. Alternatively, pack your hiking boots and check out the stunning mountain landscapes of the Cao Pang mountain ranges, where you can catch a glimpse of fascinating wildlife and birds. Vietnam is a sub-tropical climate, though the north and south experience extremely diverse temperatures. The northern regions commonly see 40ºC dry heat temperatures alongside on/off snow and frosts from the Northern Mountains. The most popular tourist season is between April and October, though be warned: this is summer monsoon season and typically brings very hot, humid weather. November through to February is generally cooler and drier. July to November sees the arrival of violent and capricious typhoons that strike central and northern Vietnam. The distance from the UK to Vietnam is typically around 5730 miles. To fly from London Gatwick to Hanoi takes roughly 12 hours. Booking your holiday to Vietnam with Travelbag really could not be simpler. You can book directly online or, if you'd like any advice or assistance, give our travel experts a call today on 0203 139 7074. It means a Vietnam holiday has the capacity to surprise at every turn, whether you’re sprawled on a beautiful beach in Ha Long, learning more about its recent history in Ho Chi Minh City, exploring the Old Quarter of Hoi An or joining the locals for a spot of tai chi alongside Hanoi’s Hoan Kiem Lake. You don’t just visit Vietnam, you become part of Vietnam. 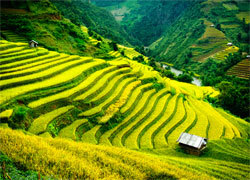 Vietnam is a fascinating country filled with culture, adventure and character. An ever-increasing number of tourists descend on its shores every year and there is so much to see and do. But, what do you need to pack? If you will be doing a lot of travelling during your trip, heading to cities and the like, you should have soft shell bags to save weight, a money belt and backpacks for excursions. Don’t worry about packing for each and every day if you are staying for a prolonged period because laundry services are always available. You are likely to need some swimwear for beach destinations while bigger cities will demand dressier clothing when experiencing the nightlife. Try to make sure you keep it as lightweight as possible because that makes things easier to carry and layers are simpler to regulate. Trainers and flip-flops are good options on your feet generally, but consider appropriate hiking shoes if you are doing those types of activities. Light jackets are recommended in case you get caught in rain and pharmacies are unregulated so you can get cheap drugs and medicines if needed once there. Elsewhere, the sun is powerful and the insects are biters so the appropriate creams and sprays for dealing with these things is important while adapters are easily forgotten but, nonetheless, important. The need for certain items of clothing varies dependent on where you are going to be during your time in Vietnam so always ask about the weather in your region when readying a checklist. Hot and wet or hot and dry are basically your two options when planning your visit to Vietnam. The climate is classed as tropical monsoon and there are a couple of seasons across the year, southwest monsoon between April and September with northeast monsoon running from October to March. The latter of the two is the dry season across pretty much all the country. Humidity is comfortable and the sun is out meaning it is the peak season for tourism and a great time to head to the beach. December, January and February are at the top and while it’s great for the beach it is also nice for exploring Vietnam. Temperatures rise and with it humidity and rainfall after this and trips to some parts of Vietnam can be uncomfortable. That isn’t to say you will be soaked all the time as it is too wet for trekking most of the time but showers in Central Vietnam and the beach resorts can be intermittent. June and July can be hidden gems in terms of escaping the crowd and getting better weather. How you arrive in a city can often shape your opinion of it – take a motorbike taxi in, or a xe om as they’re known locally, and you’ll soon understand what Ho Chi Minh City is all about. Fast-paced but with a rhythm that somehow flows, Saigon (as it’s still known locally) is a perfect introduction to metropolitan Vietnam. If you’ve just arrived in the country then it will be a great way to dive in headfirst and get to know the food, the culture and the people. If, on the other hand, you’re arriving from the Vietnamese countryside to the north then be prepared to see a whole new side of Vietnam. Ho Chi Minh offers plenty to do within the city limits and is a great base for day trips, such as the unmissable Chu Chi Tunnels and Mekong Delta, so it can seem overwhelming. Spending a day getting to know it, soaking in the atmosphere and slowly taking in its most famous sites without any rush, is the only way to get started in Saigon. Kick things off with a morning stroll through Tao Dan Park where you can pick up a fresh coconut to drink from and a cheap breakfast of banh mi, a Vietnamese baguette filled with salad and Laughing Cow cheese, along the way. Baguettes and Laughing Cow might not sound too authentically Vietnamese, but they are some of the vestiges of French colonial rule that you’ll find around the city. The park is a great place to people watch when huge numbers of locals congregate to exercise early in the day and elderly gentlemen bring their birds along, in their cages, to sit at the park’s cafés. 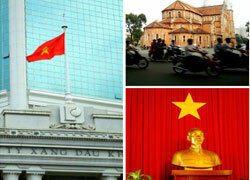 From the park, move onto Saigon’s Reunification Palace for a slice of political history. The building has been home to French and Japanese colonists as well as the anti-communist South Vietnamese government, it is most famed as the site where a North Vietnamese tank crashed through its gates and ended the Vietnam War – or, as it’s known in Vietnam, the American War. Parts of the palace are like snippets from that same period; look out for the ‘gambling room’ that is straight out of the 1960s replete with cream and brown leather seating, orange curtains, and teak sideboards. Most fascinating about the palace however is the basement where you’ll find the secret rooms that were used during the war and you’ll be able to spot the telecommunications equipment and maps charting the war’s progress. Once you’ve had your fill of twentieth century history take a break for lunch – this has to be a bowl of steamy pho noodle soup. Post lunch, take a stroll past the Notre Dame Cathedral and the Central Post Office, both perfect examples of French colonial architecture. Pop into the post office if you want to catch a glimpse of the beautiful arched roof inside, before moving onwards to Ben Thành Market. During the day is the best time to head to the indoor section of the market, where you can find just about anything you can think of. Prices are open to negotiation so don’t be afraid to make a lower offer! This is a great spot for picking up speciality coffee and other edible treats. If the hectic market and haggling for the best price has left you in need of a break, stop off for a ca phe sua da, iced coffee with sweetened condensed milk. This is the kind of coffee that will no doubt please the most seasoned of coffee drinkers and newbies alike. A day exploring such a big and busy city can take it out of you – especially your feet! Move on over to Glow Spa, just a ten minute walk from Ben Thành Market. Treat your feet to an hour long reflexology treatment and herbal foot soak in this spotlessly clean and reasonably-priced boutique day spa. By now you might have dinner on your mind, so why not check out the newly-refurbished Propaganda where you’ll get modern Vietnamese food, imaginatively presented. Don’t forget to wash it down with a cold Saigon beer! Vietnamese is a tonal language so it always pays to have destinations for taxi drivers and xe oms written down. There is only one way to cross a road in Saigon: get walking and don’t stop – as long as you keep moving, the traffic will deftly weave in and around you, stop or change pace and you might be in trouble. If you plan to visit any temples then remember to dress modestly – don’t wear shorts on those days and make sure your shoulders are covered. Carrying a large silk scarf can be useful as it doubles up as a shoulder wrap and a head wrap to protect you if the sun is strong.